DayBack offers inbound and outbound APIs. Inbound APIs let you do things like make buttons in your other Salesforce pages that control behaviors in DayBack. These buttons manipulate DayBack's url and can do thinks like navigate to DayBack and show a specific event, or navigate to a specific view in DayBack and filter for a specific campaign. Learn more about adding DayBack buttons to your layouts. Outbound APIs (webhooks) let you run you own scripts from within DayBack or jump outside of DayBack to call routines in other applications. Most outbound calls are trigged by a "custom action"--a button you add to an item's detail drawer in DayBack. You can also trigger calls from events that are already happening within the calendar--things like editing, creating, or deleting event can be configured to call actions without the user needing to click a button: we call these "event actions". Most everything. We don't allow access to the global window object but all built-in functions for window can still be called directly. For example: open(), close(), alert(), location.href, can all be used as long as you don't use them in the context of window. In other words, use location.href instead of window.location.href. 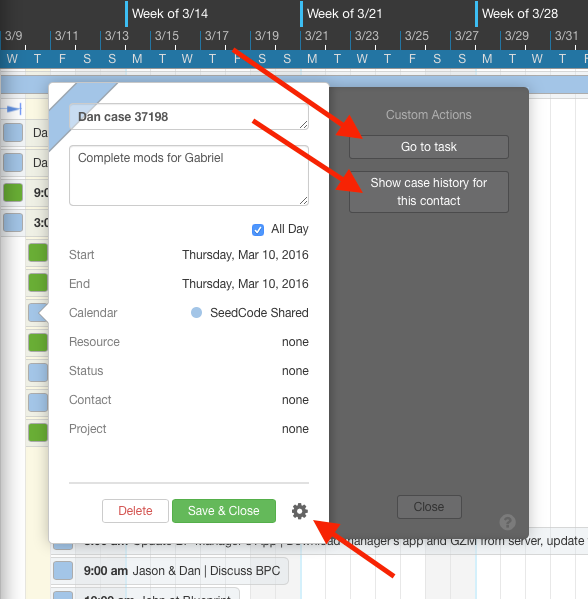 For examples of using fbk.client() and fbk.context() in a DayBack custom action, see the "Create a New Salesforce Record from a Google Calendar Event" example here: Google Calendar Actions in Salesforce. DayBack also includes a few popular libraries to make coding easier. jQuery, BootStrap, and moment.js are all included. So anything you can do in one of those libraries can be used in a custom action. DayBack gives you the ability to specify data tokens that will be replaced by event data at the time the custom action is run. This is useful for passing event data to other services for example. All data tokens are wrapped in double brackets with the mapped field name [[DataToken]]. For example, if you wanted to reference the ID field as it is mapped by default it would look like this [[Id]]. Data tokens use the names that you assigned when you mapped your fields in the source settings (your field names).